Periphyton being collected at Cake Eater Lake. Utqiaġvik, Alaska. Photo by Ruth Rodriguez. The research team will maintain 6+ federally funded projects working across the Barrow Peninsula (NSF, NASA, NOAA, DHS). Collectively, these projects are helping to advance our knowledge of terrestrial, aquatic, coastal and marine ecosystem structure and function and how these systems are responding to arctic change. They will use observational, experimental, retrospective (i.e. resampling of historic sites), low- and high- tech approaches for our research. A typical day in the field is highly seasonally and weather dependent. On good weather days, we try and get out on the boat to work our coastal sites, on most days we visit our terrestrial and aquatic sites, and on bad weather days we catch up on equipment maintenance and data, cleaning, etc. in the lab. 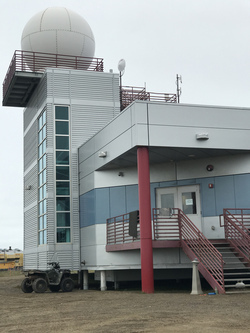 The Barrow Arctic Research Center (BARC) is run by Ukpeaġvik Iñupiat Corporation (UIC) in Utqiaġvik, Alaska. Photo by Ruth Rodriguez. The research team will be based out of Utqiagvik, Alaska. From there they will hike, use a truck, ATV and boat to gain access to their field sites. Dr. Craig Tweedie is a Professor with the Department of Biology and Directs the Environmental Science and Engineering Program at The University of Texas at El Paso (UTEP). Dr. Tweedie earned his PhD in subantarctic climate change biology and switched to Arctic terrestrial ecology when he began his postdoc at Michigan State University in 2000. 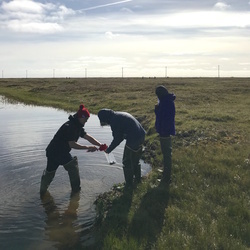 With many active collaborations both in the US and internationally, Tweedie maintains an active research program that is focused on land cover change and the impact this has on terrestrial and coastal ecosystem structure and function in the north Alaskan and Beringian Arctic and in the Chihuahuan Desert. Dr. Tweedie also has strong interests in education and outreach and the use of cyberinfrastructure to advance environmental science. Dr. Vanessa Lougheed is an aquatic ecosystem ecologist at The University of Texas at El Paso. She is an aquatic ecosystem ecologist interested in nutrient cycling (N, P, C); bioindicator development using plants, invertebrates and algae; and the use of remote sensing in monitoring ecosystem change. She is also interested in the role of hands-on research opportunities as transformative educational experiences. Her research focuses on wetland and coastal environments of the Arctic, as well as ephemeral waters of the Chihuahuan Desert. From the bottom of the earth, to the top! How amazing! I can't wait to follow your expedition! Great moose photo!!! So cool! Great photos! I'm looking forward to following your adventure! Hi Monica! I am so jealous that you saw that moose. What a great action photo!